I could count the number of conventions I've attended in the last three years on one hand and spot you my thumb. That's a sad situation I hope to remedy this year, mostly because I had so much fun at the two events that I did attend in 2007. I was a guest at the Syracuse Heroes Expo on Sunday, October 21. This is a single-day event put on by Jeff Watkins and, without a doubt, it was the best single-day event I have ever been part of. The guest list would have done a convention twice its size proud. I had the wonderful Brinke Stevens on one side of me - the talented actress is also writing and, more importantly, selling screenplays these days - and the inexhaustible Ethan Van Sciver on the other. I say "inexhaustible" because Ethan spent the entire show drawing free sketches for the fans, dozens of great pieces flying from his pencil without pause. Had I not been so in awe of his performance, I would have asked him for a Black Lightning sketch. I got to catch-up with Feedback from the Sci-Fi Channel's Who Wants to be a Superhero, as well as meet the cool Scott L. Schwartz from Ocean 11 through Ocean 13 and many other movies and TV shows. Among the event's other comics guests were artists Chris Brunner, Chris Giarrusso, John Hebert, Pop Mahn, and Dave Ross. There were plenty of retailers at the show, lots of costumes, giveaways, and two screening rooms (anime and horror). Watkins and his crew made sure that everyone, guests and fans, had a good time. On my usual scale of zero to five, the Syracuse Heroes Expo earns the full five Tonys. My favorite convention is Mid-Ohio-Con. The 2007 installment of the legendary show - Saturday and Sunday, November 24 and 25, at the Columbus Convention Center - was easily one of the best, but I can't give it the hundred Tonys it deserves on account of doing so would be a conflict of interest. In addition to being a guest at my pal Roger Price's show, I was also the event's Program Director, the guy who comes up with the panel programming and, if he's crafty or lucky, gets other folks to do most of the heavy lifting on them. Thanks to my crew of Gary Herrmann, Jeff Martin, and Don Hilliard, and friends like Mark Evanier, Bob Ingersoll, Maggie Thompson, Thom Zahler, Scott Crawford, Robyn Griggs, and Justin Chung, I can claim to be both crafty and lucky. For the first time in many years, I was actually able to spend several enjoyable hours during the con signing comics, talking with fans and guests, and even doing a bit of Christmas shopping with the retailers. My biggest surprise was when Paul E. Schultz presented me with a Black Lightning painting he'd done to thank me for creating one of his favorite characters. I've been given all sorts of presents at conventions - signed books, original art, t-shirts, and even baked goods - but that was a first. Less than an hour after that, Layne Toth presented me with a full-color drawing of BL. The 11-year-old cartoonist has been a guest at five Mid-Ohio-Cons and been published in 18 comic books. Peri, her 7-year-old sister, has been a guest at three and her work has appeared in five comics. This year, they appeared on a panel together and brought their Sisters Comics Annual to sell to their growing legion of fans. I can't describe how much energy the Toth sisters bring to a convention and how much they add to the family atmosphere that is a Mid-Ohio-Con trademark. Photo taken by and copyright Bruce Guthrie. The highlights of the panel programming were many, but I have to limit myself to gushing about just a few of them. The "Marvel Men of Bronze" panel reunited a small army of artists and writers from the 1970s: Rich Buckler, Gary Friedrich, Michael Golden, Keith Pollard, Roger Stern, Herb Trimpe, Ron Wilson, and ye olde Tipster. I hadn't seen some of these guys in almost 30 years, so catching up with them was a delight. Thom Zahler and Bob Ingersoll hosted the show's second annual "Superhero Trivia Challenge," one of our most popular events. It's a game show in which fans teamed with celebrities from Who Wants To Be a Superhero? - winners Feedback and the Defuser plus artist Matt Haley - to compete on the field of super-hero trivia. The prizes included comics and DVDs of the series with the grand-prize winner getting a Haley drawing of themselves as a super-hero. We roasted CBG's own Maggie Thompson on Saturday, though many of the roasters were either too nice or terrified to really turn up the heat on comicdom's favorite lady. But Michael Davis and Brian Pulido killed, Bob Ingersoll got major laughs from prop humor gone hilarious awry, and I did okay with material mostly written by the unfortunate Bob. Our roastmaster was Mark Evanier, a true master of the verbal grilling. 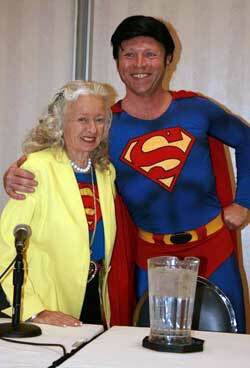 Sunday was Noel Neill's birthday - Do I have to tell you that she was the Lois Lane for my generation? - and she graciously sat for a question-and-answer panel with Mark Evanier. The convention surprised her with a birthday cake delivered by "Superman" (Scott Crawford) and provided by Experience Columbus, the official travel and tourism resource for the city. The always wonderful Neill also received a huge birthday card signed by over a hundred guests and fans. In case you haven't figured it out, all of us at Mid-Ohio-Con dearly love this woman. Since this mag isn't called Tony Isabella's Comics Buyer's Guide - I blame the shortsighted marketing department - I don't have enough pages to give you all the details of this year's con. I hung with dear friends like Maggie, Mark, and the effervescent Carolyn Kelly. I spent some time with high-school buddy Gary Lunder for the first time since he and I were seniors at St. Edward High School. I had a wonderful Mongolian barbeque meal with a group of Mid-Ohio-Con folks. I met online friends for the first time in person and renewed acquaintances with others. I conducted a little business I'll tell you about at some future date, signed hundreds of comic books, and picked up great new comics, graphic novels, and artist sketchbooks, some of which I'm reviewing this month. 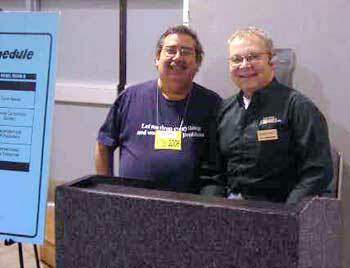 In short, I had a blast-and-a-half at Mid-Ohio-Con 2007. As long as Roger Price keeps throwing this convention and as long as I can walk, wheel, or be carried into it, I will be there. The man knows how to throw a party. "On the day the German army rode into town, I knew straight away I could not sit meekly by. I voted that every day I would do something to resist. "Derail a train, kill an officer, steal supplies, blow up an ammo dump, rob a bank." Knapp takes liberties in recreating the conversations between Hopper and his wife Paulette, who also fought in the underground, but otherwise sticks to the remarkable facts of Hopper's remarkable story. His crisp black-and-white art combines with his compelling prose to carry the reader from his protagonist's first resistence to his soul-chilling time in a concentration camp and to Hopper's post-war life. It's an amazing story told with passion and skill, the kind of graphic novel worthy of award consideration, the kind of book you can confidently give to friends and family members who don't normally read comics. 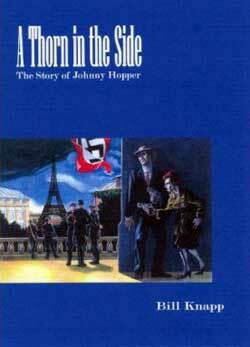 A Thorn in the Side: The Story of Johnny Hopper is the kind of book that keeps me writing these review columns month after month. It earns the full five out of five Tonys. Every Mid-Ohio-Con, my talented pal George Broderick, Jr. has a new Christmas comic to delight readers of all ages. 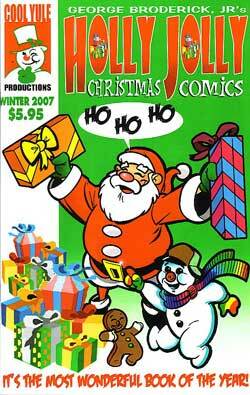 This year, it was Holly Jolly Christmas Comics [Cool Yule Productions; $5.95], 52 full-color pages of festive fun with just the tiniest dollop of good-natured sarcasm added to its heartwarming and often hilarious seasonal cheer. There are many pages of comics featuring Andy Claus (Santa's rebellious son), Greta Poinsettia, Mighty Man of Justice, Bingo the Wonder Dog, Grumpy Peri, and my new favorite, Super Duper Hooper Cooper. The comic also has a crossword puzzle and other puzzle pages, craft pages, and a keen selection of black-and-white pictures suitable for coloring. The 18-page "Super Duper Hooper Cooper and the Holly Jolly Christmas Folly," wherein our infant hero teams with pals Randolph the Green-Nosed Reindeer, Dotty the Sugar Plum Fairy, and Christmas Boy (the kid who loves Christmas more than anyone in the world) to rescue Christmas from Sinister Chad, had me laughing loudly on most every page. Hey, newspaper editors, this would be like the coolest Christmas supplement ever! I love Holly Jolly Christmas Comics more than any Christmas comic in the world. That's why it earns the full five out of five Tonys! Moonstone's Holiday Super Spectacular [$5.99] is a bit more grim than the usual Christmas entertainment, but that doesn't keep it from being a swell comic. There are five complete tales of the Phantom, Kolchak, the Spider, Sherlock Holmes, and Buckaroo Banzai, and all of them have their moments. The Phantom does his best to prevent rebels and slavers from making an un-merry Christmas. Kolchak is on the trial of a holiday monster with a taste for human flesh. The Spider, well, he faces the loss of the woman he loves at the hands of a typically twisted villain. Sherlock Holmes seeks a husband gone mysteriously missing before Christmas while, in the Buckaroo Banzai, aliens descend on our world to pay their respect to Jesus. It's a mixed bug, but, in the parlance of the season, it's way more nice than it is naughty. It earns an impressive four Tonys. Life Maxx [no cover price] is a joint effort of Chris Yambar and A Way With Words Foundation. Yambar is, of course, a beloved writer, artist, and all-around good guy. He wrote the comic, which was drawn by George Broderick, who is also all of the above. The A Way With Words Foundation is a nonprofit 501 c (3) organization, created to encourage cancer survivors. According to founder Brenda M. Rider: "There are as many treatments for cancers as there are cancers. One type of treatment is music. Another is poetry. This foundation encompasses both, helping those touched by cancer who find themselves having a way with words. This is their voice." Rider is a cancer survivor. 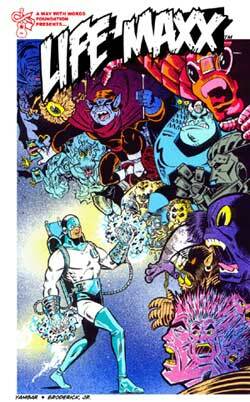 So is Life Maxx, the title hero of this comic, who mixes dispensing medical and social information with battling intergalactic villains. A second story stars Chemo Girl who, in her secret identity, offers encouragement to a young patient taking the first step in her chemotherapy treatment. In these tales, the message takes precedence over excitement. They may not be made of the kind of stuff that wins comics industry awards, but they combine for a good-hearted comic book that serves the public good. That's worth a perfectly respectable three out of five Tonys in this column. 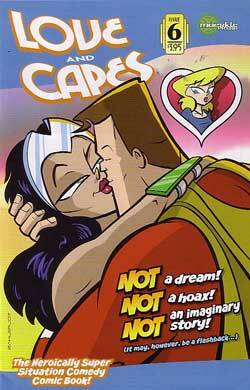 Thom Zahler's Love and Capes is the best super-hero comic being published today. It downplays action to concentrate on personable characters, the romance that binds them, and the loving humor that makes their relationship so much fun. Accountant Mark is secretly the Crusader, the world's greatest hero. Independent bookstore owner and operator Abby is Mark's true love and vice versa. The alien Amazonia is an old girlfriend who, in Love and Capes #6 [Maerkle Press; $3.95], does a signing for her new tell-all book at Abby's store. In 24 vibrantly-colored pages, Zahler explores Mark's past, reveals volumes about his character, and leaves us with a satisfying ending that will make readers eager for the next issue. The writing, art, editorial material, production values, there isn't anything Zahler doesn't do exceedingly well in this series. He's taking a bit of a break between the this issue and the next, but here's hoping he's encouraged to come back a little sooner when he finds out he just got five out of five Tonys. I'd give him six, but those smiling Tony heads aren't cheap. Maybe I should outsource them to China. After 27 years, I must regrettably announce the time has come for me to retire as the promoter of Mid-Ohio-Con. This difficult decision to take this action is based solely on personal reasons, including a desire to pursue new professional opportunities. PO Box 3831, Mansfield, Ohio 44907. Since creating Mid-Ohio-Con in 1980, I have had the unique opportunity to watch a small, local gathering of comic book fans and collectors grow into one of the most popular events of its kind in America. During that time I have been blessed with more wonderful life experiences and treasured friendships than I could have ever imagined. Special thanks must go to my inner circle of family and friends who have given so much to support me and Mid-Ohio-Con. The success and popularity of Mid-Ohio-Con is a testament to all of you. 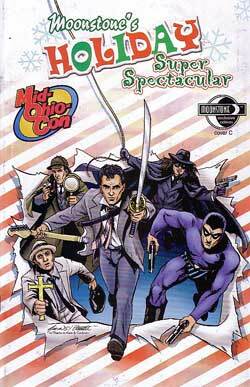 My sincere thanks to all of the retailers, exhibitors, industry professionals and media personalities who've participated in and supported Mid-Ohio-Con over the years. It has been an honor to work with every one of you. Finally, to all the thousands of fans and collectors who have become such an important part of the Mid-Ohio-Con family, thank you for allowing me the privilege of entertaining you over the years. I hope we will see each other again in the very near future. As you can imagine, this is an emotional time for me. I knew, barring extraordinary circumstances, that this was coming. I hoped those circumstances would materialize. They didn't. I'll doubtless write about Mid-Ohio-Con from time to time, but not, I think, for a while. I'll have something of an announcement myself later this week, maybe tomorrow, but I pushed everything I was planning for TOT aside to run today's column. In the meantime, thanks for spending a part of your day with me. I'll be back tomorrow with more stuff.